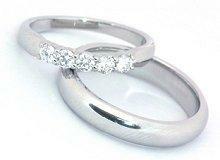 Platinum rings with partial eternity band. Wedding rings may be classic symbols of love and romance, but they don't need to be plain - this gallery of wedding ring pictures offers inspiration for the limitless variety of wedding ring styles available to today's brides and grooms. Choice of Metals: Using a metal other than the classic gold or platinum automatically makes a ring more unique. Gemstones: Diamond wedding rings are very popular, but couples can also choose to incorporate other semi-precious gemstones into their rings for a lovely design. Engraving: Adding a personal sentiment either inside or outside the ring makes it both unique and meaningful. Width: Some couples prefer narrow bands while others prefer wider bands; the ring's width is another way to make it stand out from more common designs. Age: Vintage wedding rings have classic appeal and unique styling that makes them very unique and unusual. Couples can also choose heirloom rings to add a greater family connection. Culture: Many couples opt for culturally significant rings such as Celtic wedding rings or Claddagh rings. Most cultures have unique designs that can easily be incorporated into wedding rings. When buying their wedding rings, couples need to consider several characteristics. These rings, after all, are meant to be worn for a lifetime, and it is essential that the couple be happy with their choice. Cost: More elaborate ring designs inevitably cost more, which can be a strain for a couple already planning a wedding and building a life together. Engagement Ring: Most brides prefer a wedding ring that matches the engagement ring. Bridal sets are coordinated designs already, but brides with more unusual engagement rings may need a customized wedding ring for the best match. Furthermore, the bride needs to decide if she will want to wear the wedding band without her engagement ring occasionally. Size: Most people's ring sizes will fluctuate over the years, and some wedding ring designs are more difficult to resize if necessary. 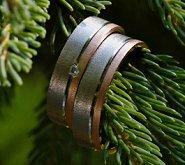 Durability: Particularly for men's wedding rings, durability is a concern. Rings of stronger metals such as titanium and tungsten are generally more resistant to nicks, scratches, dents, and other damage. Once a couple has made basic decisions regarding their wedding rings, it is time to preview different wedding ring pictures to learn what style options may work best for their needs, preferences, and budget. Click on any of the pictures below to be taken to related articles with additional information and wedding and engagement rings and pictures for even more inspiration.